Cosy wagon for two, with balcony, set in a hectare of land. The wagon is in a field, in a quiet and secluded spot. 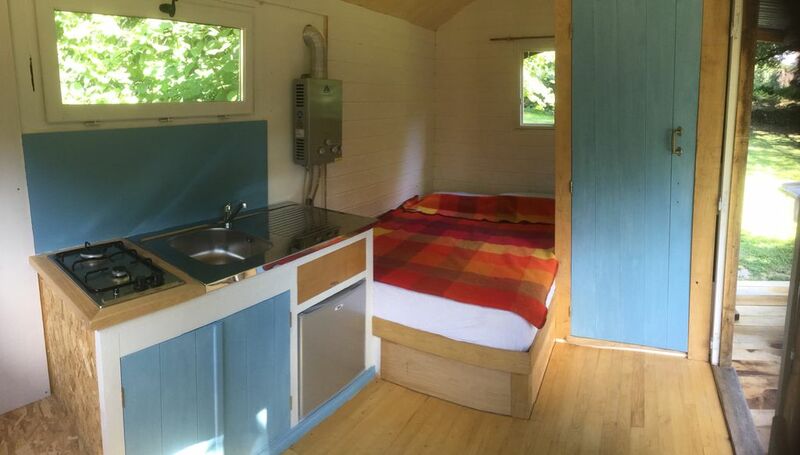 It has a double bed, a sofa, a small kitchen area and a shower. There is a dry toilet in another building separate to the wagon just a few steps down from the balcony. There is a BBQ table for outside eating plus an outside kitchen sink. On the veranda there's a double bench and table for breakfast of evening drinks. We have 6 hectares of land you are welcome to explore. The wagon is a former hay trailer which we have lovingly converted into a habitable and cosy space for 2 people. The area around it has been landscaped to make it the perfect place to come to get back to nature. There is no wifi at the moment, should you require this then you will have to come up to the house. Le Chez is a hamlet which we own, all the buildings are around the courtyard, where we have 2 gites which we have been letting for about 12 years now. The wagon is beyond the courtyard behind a barn, so not visible from the courtyard. The hamlet is 100m from a quiet D road which is 1km from the edge of the village. We are in the middle of several walking/cycling tracks (one red, one blue & one black). There is a drawer under the bed for your belongings. The shower is in a separate shower room in the wagon. Your bed will be made up for you when you arrive. Plenty of parking space up in the courtyard. There is a double sofa in the wagon. The fridge is a small camping one with a little ice box. There is a double gas hob. There are plates, bowls, cups, cutlery and pans. The kitchen area has a sink with draining board and a fridge. There are 2 dining areas, one on the balcony & the other at the BBQ table on the grass below. We are in the middle of many cycling tracks. There are tennis courts in the village.